With over 200 techniques available for examining different muscles and joints, it is impractical to accurately remember them all. 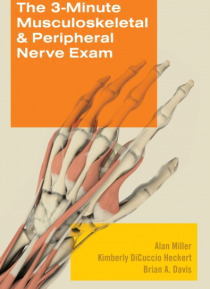 But now there is a shortcut: The 3-Minute Musculoskeletal & Peripheral Nerve Exam is a clear, concise, and accessible reference for conducting a thorough musculoskeletal and peripheral nerve examination in a clinical setting.With a consistent presentation of each examin… ation technique, this pocket-sized guide is both a tutorial for students and a reference for experienced practitioners. Each examination includes detailed photographs of models with labeled structures, and a standard format that covers:What action the patient performsWhat action the examiner performsFindings that indicate a positive testWhat the positive test signifiesCovering a comprehensive collection of the conditions for which a patient would seek medical care, The 3-Minute Musculoskeletal & Peripheral Nerve Exam features:Small, discreet trim size, perfect for quick review prior to seeing a patientExtensive use of detailed photographs for each examA section on the American Spinal Cord Injury Association examination and classification protocolsAn illustrative tutorial on gait and postureA comprehensive table of clinically relevant muscles and their action, location for EMG/Botox needle placement and nerve/root innervationA quick reference guide to all of these conditions and proceduresThe 3-Minute Musculoskeletal & Peripheral Nerve Exam will aid in the evaluation of joint problems through physical exam maneuvers and will teach the detection of muscle weakness and the examination of peripheral nerves and reflexes. It is an essential means of quick reference for residents and clinicians in physiatry, neurology, pain medicine, orthopedics, internal medicine, and family practice.